It's made by the Kult of Athena exclusive manufacturer Iron Tiger Forge, and was one of their first items on the site, but have been on backorder status for close to a year. I recently heard from Ryan at KoA that they are finally coming in. The blade is labeled as T-10 carbon steel: I remember hearing somewhere that Chinese T-10 is different than our tool steel. 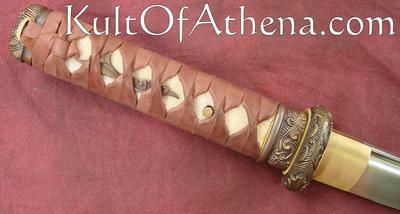 I love the hamon on this one, and I hope the performance can keep up with the looks. Any thoughts? 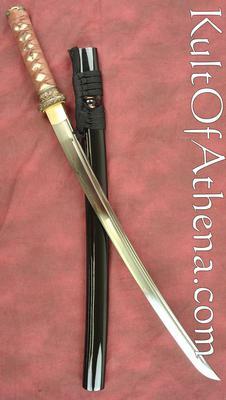 Comments for Thoughts in this Wakizashi? The blade looks good, T10 is the same everywhere - there was a rumor that T10 is 1095 carbon steel, but I have no idea where this started and it is not correct. T10 is T10 - you can order both types from China and T10 is more expensive and looks different (plus it has different properties). The only thing I don't like about it is the ito - the wrap is really ugly and doesn't look very secure.. Otherwise, pretty hard to go wrong.